Bioprospecting is the search for useful organic compounds in nature, commonly involving the collection and examination of biological samples (plants, animals, microoganisms) for sources of genetic or biochemical resources. 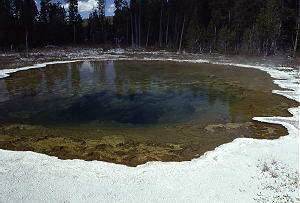 The Mushroom Pool, located in the Lower Geyser Basin of Yellowstone National Park, is the site where Thomas Brock first discovered Thermus aquaticus colonizing the extremely hot waters of this and many other Yellowstone geothermal features. NPS photo taken by Jim Peaco courtesy of the Yellowstone Digital Slide File. Bioprospecting has been conducted for centuries, but in recent decades the field has grown rapidly with the discovery of extremophiles and the subsequent technological advances in the pharmaceutical, biotechology, and agricultural sectors. 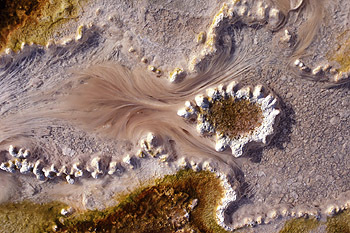 The thermophile (exteme heat-loving microbes) Thermus aquaticus was first discovered in the Mushroom Pool of Lower Geyser Basin in Yellowstone National Park by Thomas Brock in 1966. The discovery of T. aquaticus led to scientific and economic benefits far beyond what anyone would have imagined. An enzyme of T. aquaticus, called Taq polymerase, was found to be capable of surviving intense heat and allowed scientists to make billions of copies of DNA in a few hours through a process called the polymerase chain reaction (PCR). PCR can be used to amplify any type of DNA and in turn has contributed significantly to DNA fingerprinting, disease diagnostics, and forensic analysis, earning millions for the patent holder. Much of modern biotechnology is based on the use of enzyme catalysts for biochemical reactions, including genetic engineering, fermentation, and bioproduction of antibiotics. 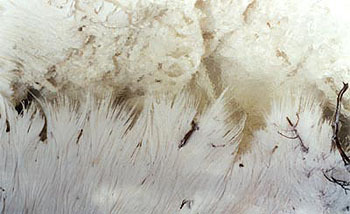 In addition to T. aquaticus, bioprospecting has yielded other microbes that prove useful in biotechnology such as in producing ethanol, treating agricultural food waste, bioremediating chlorinated hydrocarbons, recovering oil, biobleaching paper pulp, improving animal feed, increasing juice yield from fruits, improving detergents, and a host of other processes. Bioprospecting has expanded to geothermal features across the world, where thermophiles have been found colonizing the thermal waters. Areas such as New Zealand, Costa Rica, Iceland, Japan, and Russia's Kamchatka Peninsula as well as ocean floor thermal vents known as black smokers are explored for potentially useful microorganisms. After the discovery of T. aquaticus in Yellowstone and the development of PCR had resulted in a multi-million dollar business, the issue of benefits-sharing agreements for future bioprospecting in Yellowstone came to the forefront. Federal legislation authorizes the NPS to negotiate agreements that would provide parks a reasonable share of profits when park-based research yields something of commercial value. In 1997, Yellowstone became the first national park to enter a Cooperative Research and Agreement (CRADA) with the Diversa Corporation, the first ever negotiated in the United States. Diversa collects DNA from hydrothermal habitats and screens the genes for the ability to produce useful compounds. Other Diversa research sites include Costa Rica, Iceland, Antarctica, and at the bottom of the Pacific and Atlantic oceans. The Benefits-sharing agreements in Yellowstone allow the park to collaborate with researchers and receive equitable benefits, such as equipment, training, or funding for conservation projects, when research on biological material from the park returns commercially successful inventions. Benefits-sharing agreements are increasingly used in other countries to protect biodiversity by allowing the host nation to benefit from commercial discoveries that depended on its national parks and other protected areas. This collection features selected Online Resources concerning bioprospecting in Yellowstone National Park and an Educator's Guide presenting various methods of using this information in the classoom. Yellowstone Bioprospecting Online Resources: a collection of digial resources such as news articles, websites, journal articles, and official Yellowstone National Park websites. Educator's Guide: a collection of activity ideas and pedagogic resources to assist in planning units and lessons on bioprospecting in Yellowstone National Park.